To find out more information on upcoming events, please click on the event below or contact the Chamber directly. The events schedule is updated on a regular basis, if there are specific events, training needs you would like to see included, please do not hesitate to contact the Chamber on admin@kilkennychamber.com to discuss further. Stableford Shotgun start at 2.00 pm. Open to Men and Ladies with GUI Handicaps. Registration at 1.00pm sharp. Payment to be received by 23rd May to secure booking. Meal and Prizegiving at 8.00 pm. Prizes for Longest Drive and Nearest the pin. 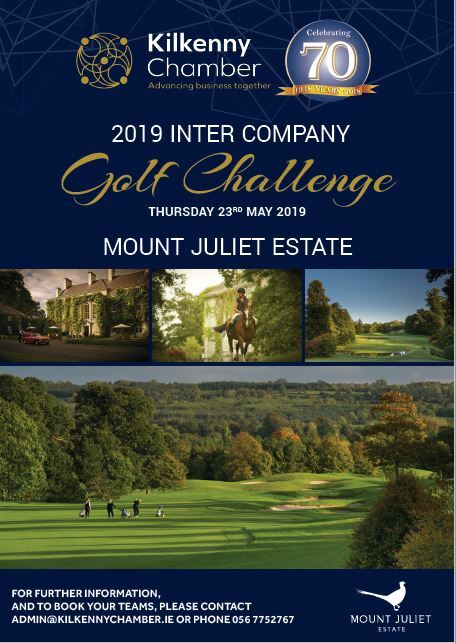 Contact 056 7752767 or email mailto:admin@kilkennychamber.ie to book your teams.